Please refer to our stock # 1137 when inquiring. 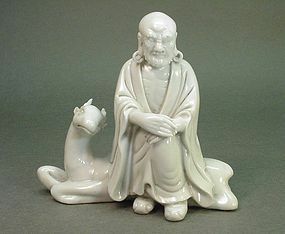 This Chinese Blanc de Chine statue of an Arhat (the Chinese name is Luohan) is an 18th century product. Blanc de Chine (French for “White from China”) is a traditional European term for the type of white Chinese porcelain that was made at the Dehua kilns in Fujian province. It is known as Dehua porcelain. The Dehua kilns have been producing this kind of porcelain from the Ming Dynasty (1368~1644) to the present day. Large quantities were sent to Europe as Chinese export porcelain in the early 18th century. The Qianlong Emperor (1736~1796) was a great admirer of the Eighteen Luohans 十 八 羅 漢. He traveled to Shengyin Temple in Qiantang (present day Hangzhou) to view the original paintings by the monk Guan Xiu 貫 休. While there, he not only examined the paintings but also wrote a eulogy to each Luohan’s image. This statue is one of the Eighteen Luohans called “Deer Sitting Luohan” 騎 鹿 羅 漢. According to Qianlong’s eulogy, “Sitting dignified on a deer, as if in deep thought. With perfect composure, he is contented with being above worldly pursuits”. The milk white statue is 5” high, 5 ½” long and 2 ½” in depth. It has the well known maker’s mark “He Chao-Zong yin” 何 朝 宗 印 on his back, indicating that it was made by the Master He or by a member of the “Family He”. The statue is in excellent condition. More detailed photos are available.